I hate it when I come in here and have to push my way through the massive spiderweb someone's built blocking the doorway. (Where did that come from? I'm sure I've never knit any spiders). Pardon me while I spit out some spiderwebs and brush them out of my hair and off my glasses. There may well be some dust bunnies breeding in the dark corners too but I get that. Bunnies do breed like bunnies and I've certainly knit enough of them over the years to have a substantial breeding colony of the things. It looks like I may have been neglecting my little corner of cyberspace just a little. A tiny, incy weeny tad (or something). Let's just get a broom and a mop and bucket and clean up a little in here, why don't we? There, all neatly spick and span again. Now, I really did come in here to show you things. (Actually I got pushed in...) I have been creating lots and lots and lots. 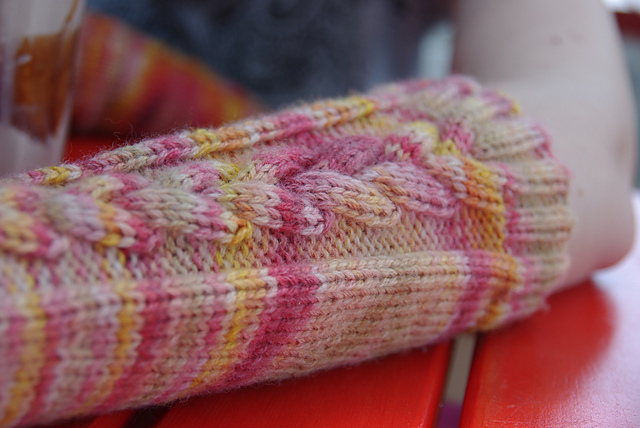 I have one, no two, three, four (and possibly some more) new knitted finished objects to share with you. I've been so busy knitting and crocheting away (and working flat out, but let's not mention that) that I've forgot to give each happy little knitted object a chance to recount its journey and shine. They may have got a little bolshi on me demanding little creatures. So here I am to do their bidding. 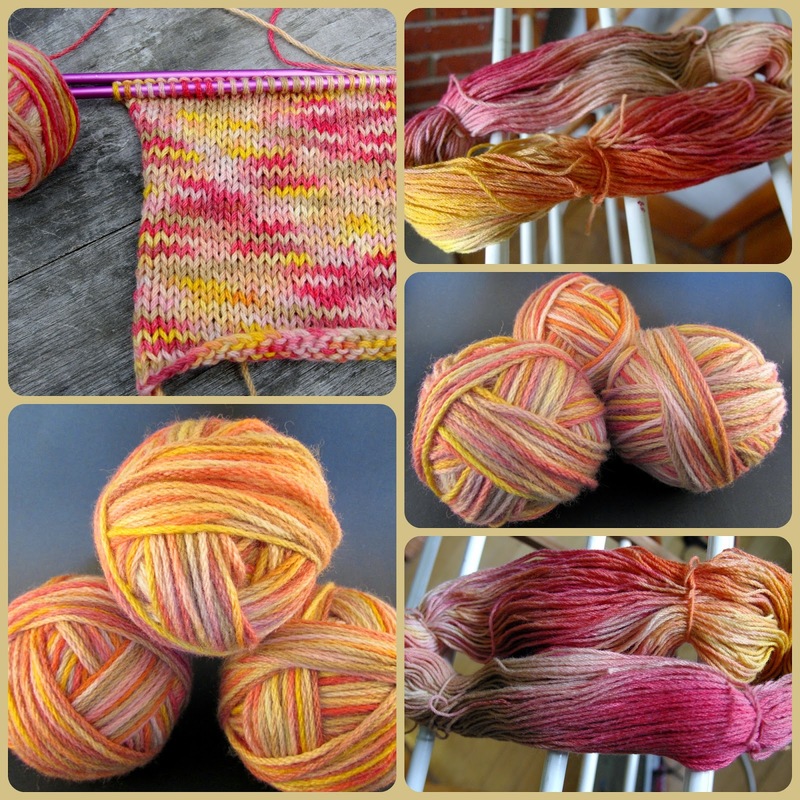 Remember how back on New Year's Day my daughter and I dyed some beautiful yarn? With food colouring and tea and coffee and microwave? She commissioned some elbow length cabled gauntlets. 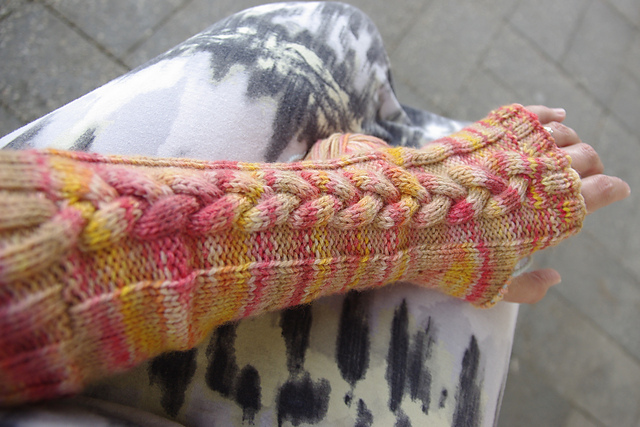 She settled on Lady Jane Grey's Gloves by Sarah Lady. These are elbow length with a plaited cable on the the top and shaped to fit the arm. These were one of my first projects for February COM (Cast on Month). The idea is to cast on something new for every day of the month of February. I didn't quite make it but it was an awesome ride along the way. The first glove wasn’t exactly smooth sailing. I had to use 3.75 mm rather 3.5 mm as suggested in the pattern. (3.5 mm is not a standard size in Australia). The I misinterpreted the instructions for the placement of the thumb gusset and got to the top of the gusset before realizing I had to frog back about 18 rows and move it over to where the thumb is actually anatomically situated on the hand. I successfully completed to top of glove but then frogged back and re-knit the edging on 3.25 mm needles to make it fit tightly enough around Mel’s palm. This is a free pattern and not for the faint-hearted novice. It is a little primitive in its writing style only detailing the cable section and describing where to place it. It requires some intuitive decisions that only come from years of experience. (That said, it is a lovely design). I love how the colours spiral around this. It makes me happy just to look at it. The second mitt took only two days with no fuss and drama attached! I need to dye more yarn! 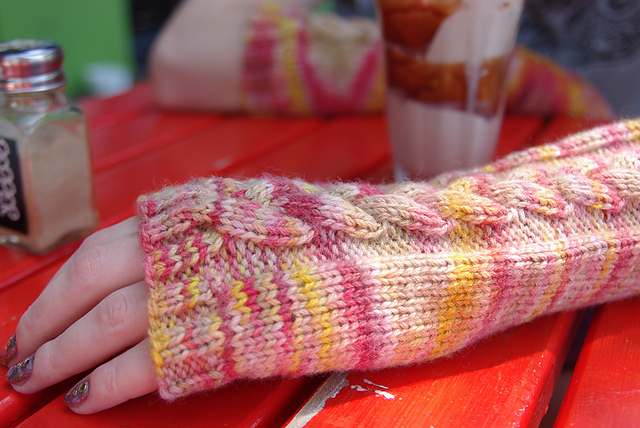 it’s eleventy times more fun to knit with your own hand dyed yarn! 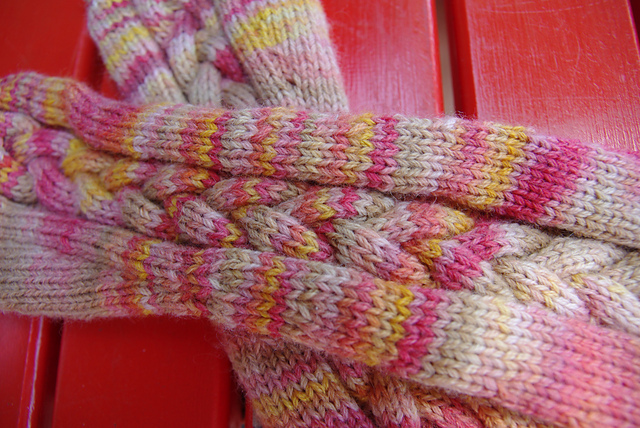 Yarn: Hand dyed aran weight machinewash wool. The children staged a photo shoot for this in a local cafe complete with decadent iced coffee / chocolate beverage. 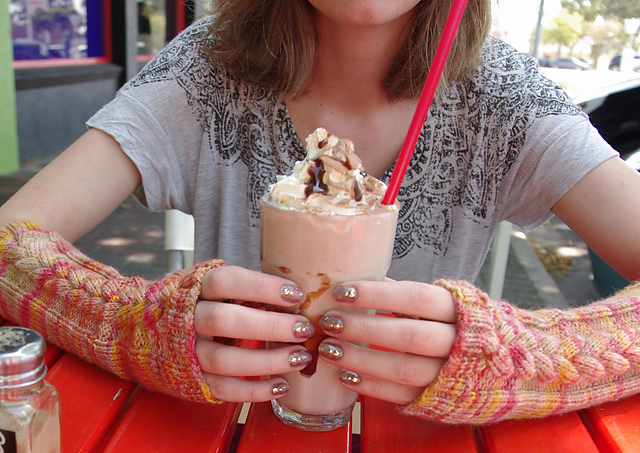 Mel created a personalized unique manicure to highlight her gloves. (Some of my North American virtual knitting friends suggested that these are just the ultimate cosy mitts for winter coffee runs. The kids did the best to recreate this scenario in the middle of an Australian summer). It's all finished. I just have to get it to consent to photos. I'm thinking Good Friday couch Potato day is a perfect time for this. It has been used so much since I finished it in early February that it may need a wash before it has its photo taken. I'm working on the next two at the moment.